Daylight increases by nearly 90 minutes during the month as the sun’s direct rays cross the equator moving north at 11:57 a.m. on March 20, 2014. We advance our clock one hour on March 9 to start daylight time. This will certainly bring back the discussion of year-round daylight saving time. In 1974 and 1975 daylight saving time was started earlier in those years as a national response to an energy shortage. Last year Allison Schrager suggested that the United States should adopt two time zones and eliminate daylight saving time. Here is my commentary on the idea. 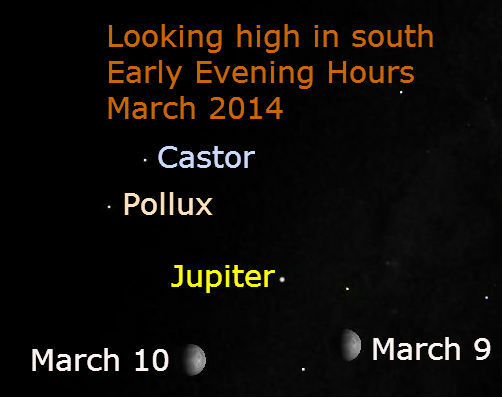 New Moon March 1 (2 a.m. CST) 6:19 a.m. 6:30 p.m.
Jupiter continues to dominate the evening sky. It is well placed high in the southern skies at sunset. Early in the month, look up high in the southern sky (as seen from northern latitudes); Jupiter’s current position is near where the sun will appear at noon in late June. 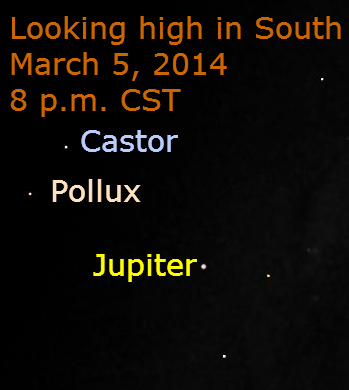 Jupiter appears high in the southern sky during the early evening hours of March 2014. The chart above shows Jupiter against the starry background of Gemini with its bright star, Castor and Pollux, nearby. Jupiter resumes its eastward motion compared to the starry background on March 6. A few nights later, a bright waxing gibbous moon appears near Jupiter. On March 9, the moon is 7 degrees to the lower left of Jupiter. The next evening the pair is separated by 9.5 degrees. Mars rises in the southeast at 9:30 a.m. early in the month. It appears near the star Spica. 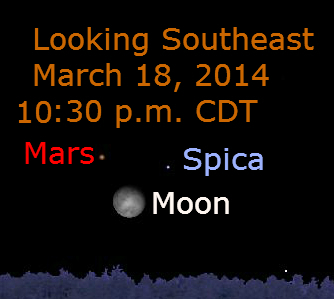 On March 1, Mars is 6 degrees to the lower left of Spica. While not vivid, Mars is distinctly reddish and Spica is blue. The colors can be amplified while looking through binoculars or a spotting scope. Mars is over twice as bright as the star and will continue to brighten throughout the month. The planet begins to move westward or retrograde compared to the starry background. Mars passes 5 degrees above Spica on March 24. The progress of Mars’ retrograde loop is chronicled in this posting. On the evening of March 18, the waning gibbous moon, just 2.5 days past full, makes nearly an equilateral triangle with Mars and Spica. The moon is separated from the other two objects by about 4 degrees with Mars and Spica separated by 5 degrees. Saturn rises in the southeast before midnight early in the month and at 10:30 p.m. by month’s end. It is about 30 degrees to the lower left of Mars near Zubenelgenubi and Zubeneschamali in Libra. 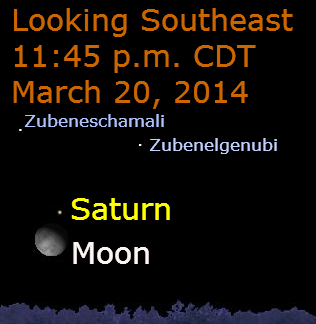 As the moon rises on the night of March 20/21, it appears 2 degrees below Saturn. Venus continues to outshine all other starry objects. Early in the month, it rises in the southeast at about 4 a.m. We continue to update its visibility with images at this posting. Mercury makes a brief appearance during the month and is difficult to see. 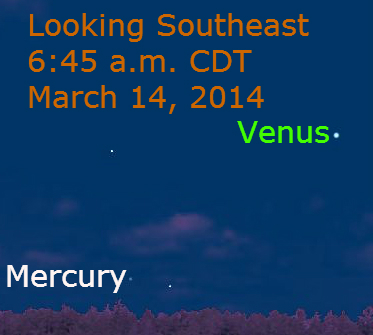 Before dawn on March 14, Mercury appears 19 degrees to the lower left of Venus. 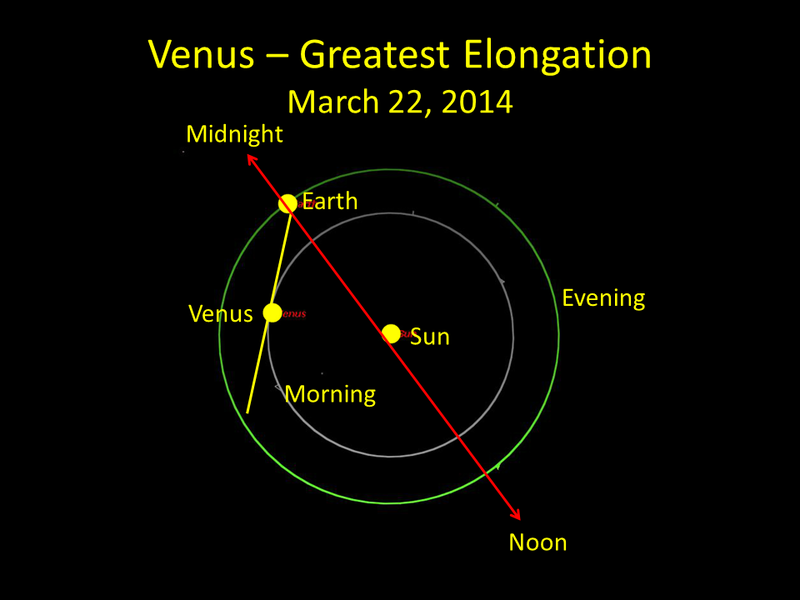 Venus reaches its greatest elongation (angular separation) from the sun on March 22 and rises about 2 hours before the sun. 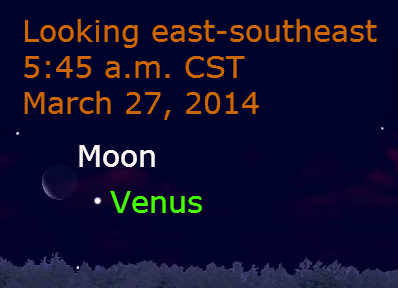 On March 27, the waning crescent moon appears 3 degrees to the upper left of Venus. 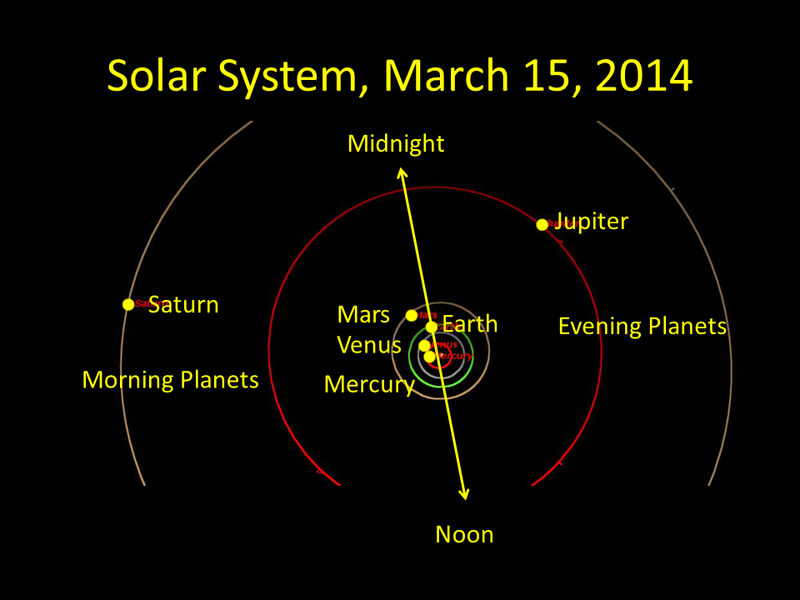 The image above shows the planets visible without a telescope (naked eye planets) on March 15. (Click the image to see it larger.) Jupiter is the lone planet in the evening sky. Mars is near the midnight line, meaning that it is approaching its nearest point to Earth. Meanwhile, Venus, Saturn, Mars, and Mercury are visible in the morning sky.